Etymology: "Wild cherry tree" means that this cherry tree is growing wild in forests. The Latin "Prunus avium" means "bird cherry" because birds like the fruit. Its popular name in Europe is "guignier" and the fruit, the "guigne" or bigaroon. Origin: Caspian Sea, spread in Europe in prehistoric time. The only tree of its family not to be cultivated, the wild cherry tree spreads naturally in forests. The royal prescription of 1669 puts an end to its proliferation (!) in forests. Ones prefers oaks in the forests, which is more useful. Right and long trunk (# cherry tree). In forest, the wild cherry tree must rise to search light, hence its upright form. Bark: harsh shedding in horizontal, shining strips, ruddy reddish-brown. As in the cherry tree, the bark of the wild cherry tree is pierced by lenticels. Deciduous foliage. Leaves (13 cm) alternate, oval, pendulous, toothed, with 2 glands at the base of the blade. Flowers in white clusters on a long peduncle, in April-May. Fruits: wild cherries, with long peduncles, turning black by maturing. Uses: wild cherries are used in jams, preserves and brandy (the "griotte" from the Provençal agriota, "sour", or the kirschwasser in Alsace). The merisette of Grenoble cooks up with almonds puréed by the stones of wild cherries, which are fragrant with the cinnamon, cool leaves to fish and cloves. The bark of the wild cherry tree enters the composition of the bitter. Finally, its wood is searched in cabinetmaking due to its compact texture and to its colour ruddy reddish-brown which it acquires with time. It is necessary to let it dry 2 - 3 years, with its bark, or put it in oven (artificial drying). It can resemble the mahogany tree after a specific treatment. It is made chairs, articles of violin and turning, cheap pipes. Prunus avium is a rootstock for fruiting cultivars of cherry trees. The classification and origin of many varieties of cherry trees are complex and controversial issues. 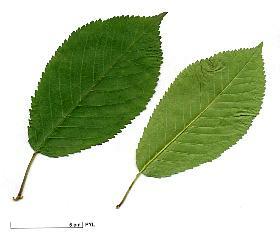 It seems accepted that only two Prunus species are causing crop varieties: wild cherry (Prunus avium L.), the origin of sweet cherries, and sour cherry (Prunus cerasus L.), the source of bitter or sour cherries, and the hybridization of these two species and or their varieties. The "Guignier" has soft fruit and covered with an aqueous skin adhesive, white, red or blackish red. Their juice is often colorful, rather tart. The word probably comes from Kign, name of the wild cherry in Celtic language. It is believed that various crosses between wild species, or varieties derived from it, have created so-called varieties of cherries English, with tender flesh, very sweet but tart, combining different degrees has the characters of both parents. This seems to have started breeding early and Pliny the Elder says that seven varieties of cherry trees were known to first century AD. Today it is estimated that the number of cherry varieties is around 200 but only a dozen of them represent almost all of current production.